The first major project undertaken by The Friends was the conservation of the Roll of Honour. Details of the conservation, the history of the Roll and the ongoing work in connection with the names on the Roll can be found under the ‘Roll of Honour’ tab. The Friends were awarded a grant by Environment Wales to commission a flora and fauna survey of the churchyard. This was the first step along a long road to assess the churchyard as a site of safe public green space. 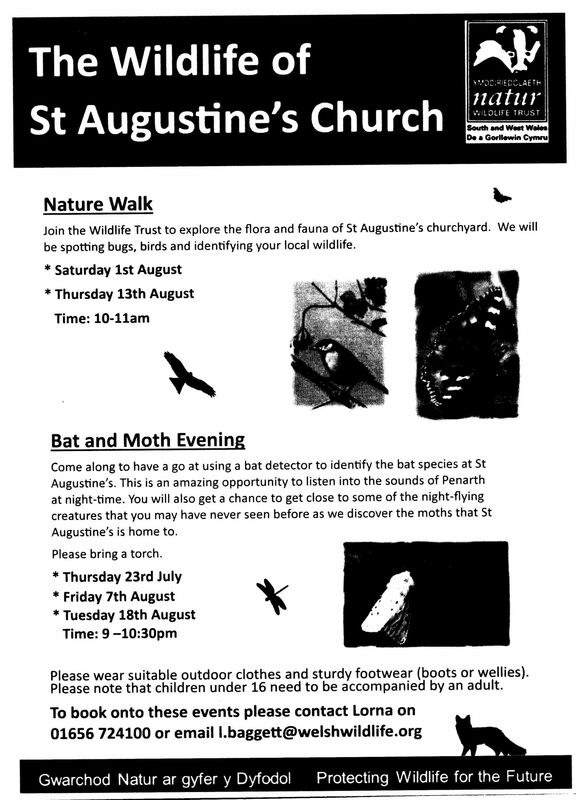 The project seeks to safeguard the environment of the plants and animals that live in the churchyard while at the same time promoting enjoyment of the space by the local community. The area is an ideal resource for encouraging greater understanding of wildlife and biodiversity. 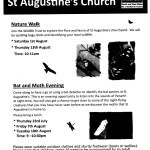 Bird, bat and swift boxes have been put up and it is hoped to put up a bug house to encourage the various insects, including bees, that live in the churchyard. That is the habitat side of the coin. The other side is the heritage aspect of the churchyard. St Augustine’s was the site for burials in Penarth before the opening of Penarth Cemetery and contains many old and interesting graves. Sadly, many of these graves and tombs are decaying and in a dangerous condition. The slope of the ground, fallen and leaning kerbs and stones make it difficult to walk around the graveyard and this is an issue that will also be tackled. A Steering Group has been set up and work has begun on the churchyard. Necessary safety work has been carried out on the trees in the churchyard. A path is being cut between the graves on the south of the church. There is now an information board by the west gate giving details of the work as it progresses. We are raising money for the conservation of Joseph Parry’s grave and it is hoped to start on that work soon. The details of all burials in the churchyard from 1813 to 1998 are being entered onto the Burial Grounds Management System site which is run by Atlantic Geomatics. When this work has been completed we will photograph the memorials and the images will be linked to the names recorded. This will provide easy access to the information about the burials at St Augustine’s. We are grateful to the Allchurches Trust and the Heritage Lottery Fund for their support and encouragement. A group of about 20 volunteers has been formed to work in the churchyard. They meet at about monthly intervals to cut the grass, cut back unwanted vegetation and generally keep the churchyard as tidy as possible. If you would like to join these volunteers please contact Debbie Court (djcourt@hotmail.com) or Andrew Davison (02920 705639). The group will next meet on Saturday 28th April at 9.30am at the church (weather permitting). Safety equipment and some tools are provided but please bring your own secateurs, shears etc. if you have them.